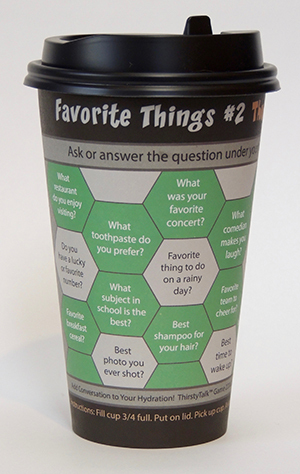 Favorite Things #2 Thumball Cups – ThirstyTalk™ game is a fun way to share a conversation about things you like. #2 in the series! Great for large and small groups! Grab a cup… Fill cup 3/4 full with hot or cold beverage. Place lid on cup. Pick up cup. Ask or answer the question under your thumb. Rotate cup, repeat. Optional: Use cup empty. Place lid on cup. Toss it or volley it like a ball… Catch it, look under your thumb, etc. Try Speed Stacking games! Spin it in the air. See who can throw it farthest!